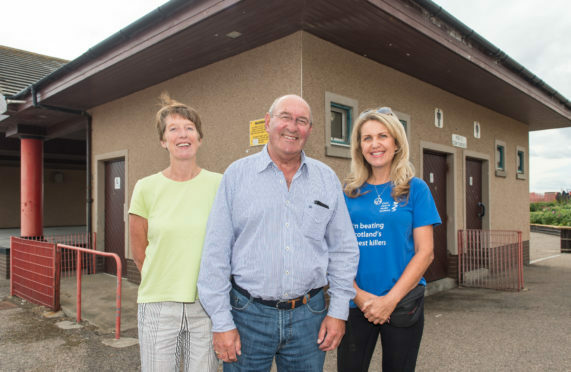 Lossiemouth Community Council members Marian Evansr, Mike Mullholland, and Carolle Ralph at the Station Park toilets. Lossiemouth Community Council has raised £1,1000 and in the coming weeks hopes to have raised the full £1,400 required to run the Station Park facilities for a year. Much of the money was raised through a collection at the weekend’s raft race at which spectators were encouraged to “spend a penny” to support the loos. The block was closed last month as part of budget cuts by the authority but has since reopened under the management of locals. Now the group hopes the council can be persuaded to take on the running of the toilets once more, with the community footing the bill. Yesterday, Moray Council explained the final say over such a proposal would have to rest with councillors. It is understood community councils across the region are taking a close look at the success of the Lossiemouth initiative and could look to replicate it. Mike Mulholland, chairman of Lossiemouth Community Council, said: “I think the council needs to sit down and talk to people who want to help their communities by keeping the toilets open. “We understand the financial constraints the council is working under and that’s why we’re happy to raise the money to keep them open. Moray Council initially proposed to shut both public toilet blocks in the town before deciding to close Station Park and keep the East Beach site open. Large queues formed at both sets of facilities at the weekend as spectators packed the banks of the River Lossie for the annual raft race. An agreement has been reached with Lossiemouth Community Council to run the Station Park block until the end of September. Long-term arrangements have still to be finalised.